"Fyrst a chalis of sylver | a koope of gren creules | ij vestimentes | one awlter | a crosse | ij small belles | iij belles in ye styple." The Commissioners were instructed to deal with the ornaments, and I know of no other case where an altar is mentioned. White's Directory (1832) says, "Edwalton Feast day is the Sunday after (old) St. Luke's day," 29th October, or on that day if it falls on a Sunday. There is a recollection in the village that this was not the Patronal festival or "Wakes," which unhappily has gone out of knowledge, but a feast more in the nature of an old-fashioned "Harvest Home." In the latter part of the 14th century the church was further enlarged by the addition of a clerestory to the nave, and this involved the rebuilding of the pier arcade; a doorway was pierced through the north wall in compliance with the requirements of processions. A stone tower, with angular buttresses, was built at the west end and made to serve as a porch with a belfry above it. This work was carried out in a superior kind of "water-stone," mixed with warm coloured calcareous limestone from a Leen Valley quarry. The architecture of this addition may be described as common to country churches of late 14th or, very early, 15th century date. One bay of the arcade. The arcade consists of octagonal flat-faced piers, having moulded capitals with abacus, bell, and necking in one stone. The moulding has been mutilated and patched until it is impossible to recover the original profile, but it seems clear that it followed the well-known 14th century pattern, although the upper member is now a square instead of the usual "scroll-moulding. "1 The pointed arches are in two orders of plain chamfers. 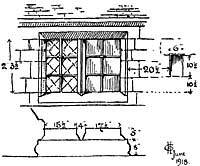 There is no tracery in the square-headed clerestory windows; the glass line is deeply recessed; a shallow "casement" is worked on the jambs and a splay on the heads. The simplicity of the design and the irregularity in execution point to this addition being also the work of village masons. 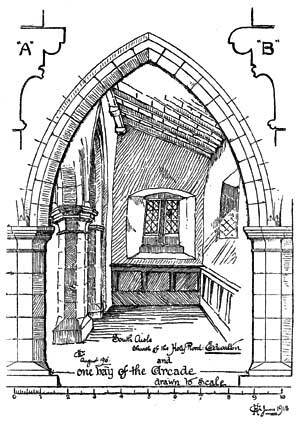 It seems clear that the nave arcade was rebuilt in place of an earlier one because it is set parallel with the north wall and not on the old foundations which were out of line; it still stands fairly upright, while the outside walls on either side, unable to withstand the weight and thrust of the roof, have assumed a bulging shape like the sides of a ship. Some have thought the walls were built thus in order to conform with the word "nave," which is derived from Latin navis—a ship (i.e. the ark of safety). We may be quite sure that the mediaeval builders did not set out to perpetuate such an anomaly. The real cause of the distortion was the lack of efficient buttresses. The later builders realized this, and partly rebuilt the end walls of the aisle, carrying them beyond the face of the south wall in order to provide abutment; the effect of the strain on these end walls is seen in the window at the east end of the aisle which is now all awry. The fragment of ancient glass in this window was picked up at Flawforth. There is a scratch-dial on the face of the south-east buttress, and another on the jamb of the south window adjoining. The clerestory calls for passing notice. The curious point is that midway between each window a small aperture (10½in. by 6in.) was formed in the masonry. I have occasionally found similar apertures in 14th century walling, which in my opinion are too large to be "put-log" holes. As they were covered on the inside with plaster, I think they were intended to assist the acoustic properties of the church, in the same way that earthenware jars were built into the walls for the same purpose, at an earlier date. The central window of the clerestory, on the south side, is the only one which remains intact and in its original position. The eastern window, when viewed from within, has lost one of its lights. This was built up in order to support the end of a tie beam of the 18th century roof. The position of the western window is now hidden beneath a sloping tiled roof, which covers that end of the aisle. The reason for this raised roof is not apparent now, but I think it would take that form in order to give headway to the staircase approach to a post-reformation western gallery which survived until the 19th century was well on its course. Whether this gallery was built to accommodate the parochial church band, or whether it was the private domain of the lord of the manor, history deponeth not, and when we enter the realm of human recollection both the manor pew and the choirmen's seats were on the floor of the nave. When the gallery was put up [probably 1716] the south-west clerestory window was taken out and reset in the centre of the north wall where it still remains. It is not without interest to note that the neighbouring church, at Tollerton, which was entirely rebuilt early in the 19th century, contains "an elegant family seat" in a western gallery approached by a staircase from the south aisle, which probably follows the arrangement at that time in use at Edwalton. We are left in doubt as to what befel the 14th century tower. The present tower is built chiefly in brickwork on the old stone foundation. The size of the bricks (8½in. by 4in. by 2in.) and the pattern of the brickwork, built with very wide mortar joints (nine courses rise two feet) relieved with a diapering of dark coloured bricks, corresponds with the remnants of the manor-house, and suggest the reign of Queen Anne as a likely date, when much brick-building was taking place in this district. No. 2. jesvs. bee. ovr. speed. 1663.—the calvary cross, crescent, star, and initials G.O. : the mark of George Oldfield. On the eastern face of the tower, the lines of the pitch of a former roof may be seen. This roof, the third in succession, was put on when the clerestory was built, and had no relation with an earlier roof of steeper pitch which had gradually pushed the old walls out of upright.
. The present flat roof was put on without any regard for the existing clerestory windows. The date is cut on the soffit of one of the tie beams, and the initials I.D. on another. These are presumably the initials of the churchwarden John Deverel, a member of a family having no connection with Edwalton now, but if we may judge by a row of headstones in the churchyard (note the variant spelling), a family of some importance in the village in those days. Unfortunately a hiatus occurs in the register of burials, 1714-1719, but a gravestone inscription supplies the deficiency. of his Age In The Yeare of our Lord 1717. And to Himself snatcht Him away.
. In the year before the mother church at Flawforth was finally demolished, the "Chapel of Edwalton" was thoroughly renovated. The north wall of the nave was in imminent danger of collapse, but it was made secure by building a massive brick buttress at either end of it. The chancel had become ruinous even before this date, and was allowed to fall into complete decay; its site being utilized for churchyard interments from 1723 onwards. (1) See sketch of aisle (p. 11) where "A" is the present and "B" the original profiles. (2) William Taylor died October 14th, 1882, after holding the office of parish clerk for forty-seven years. New bell, 3 cwt. 0 qr. 22 lb. @ 1/4 per lb. New bell, £25 1s. 10d. Old bell, £25 13s. 4d.